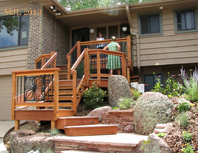 Boulder Custom Cabinets is a full service company. 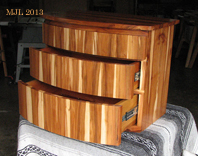 We can design and build almost anything you can imagine in the line of fine woodworking. We specialize in custom built-in and free-standing cabinets, entertainment centers, Japanese sliding screens and custom built stair and handrail systems. We also do interior trim, exterior decks and door and window replacements. 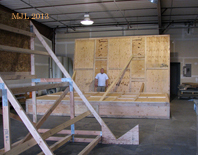 Boulder Custom Cabinets offers a wide range of services, from free estimates, permit grade drawings, construction estimating, skilled drafting and design work , fabrication, assembly, finishing and installation of whatever you might need or desire. Designs may be classic, contemporary or innovative at your discretion. 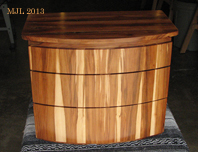 The small chest shown here is made of apple wood harvested from a back yard near 6th and Forest. The 100 plus year old tree yielded just enough fine wood for a pair of matching chests, one for each of the children who once played beneath it. Many of us here in Boulder live on steep and sloping terrain. Decks and stairs provide a safe means of ascending and descending these slopes regardless of the weather. They are frequently centers for socialization, outdoor recreation and repast. They must be comfortable, attractive and strong. They should be an integral part of the landscaping and invite both guests and residents to linger upon them. 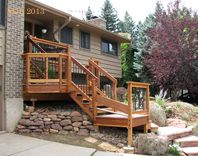 Your deck will be uniquely designed to meet these expectations for your particular property. The deck shown in this photo incorporates an Asanoha, a decorative Japanese Shoji pattern made of white oak and painted to match the black iron balusters. Please call us for a free estimate on your new deck. Often there is a need for a single cabinet to house all of your entertainment equipment and screens. 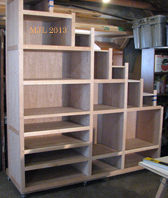 Custom cabinets may be the ideal solution. They may be natural wood under a clear finish or painted to match or accent your room décor. 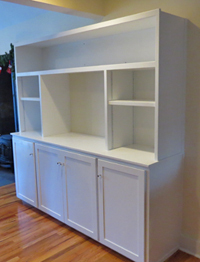 The unit shown here provided storage for a child’s toys on the right bottom and all the video and stereo equipment on the left. The center space was made to perfectly fit the large flat screen TV. Two large pieces that had been fabricated and completely finished in our shop were delivered, installed, trimmed, caulked and touch-up painted in half a day. Our tables, desks, dressers, floor and wall cabinets may be original designs or executed in the traditional style of your choosing. Either way, our designs will uniquely fit your needs and desires. The dinette shown here is made of American black walnut. The mitered and tapered legs are secured to a slender skirt. 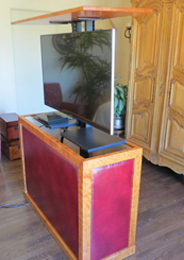 Two examples of our TV Lift Cabinets, one in curly cherry and padded red leather, the other in Russian Olive with a Black Walnut Mission Style finish. A large concealed flat screen TV at the foot of your bed that rises silently at the touch of a button so smoothly you can keep vases full of fresh cut flowers on the lid without spilling anything. 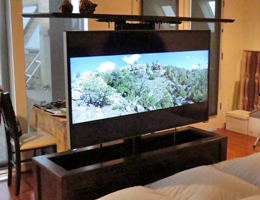 Nexus 21 and Boulder Custom Cabinets will work together to satisfy all your entertainment needs. Victorian, Greene and Greene, contemporary or classic, we can fabricate, finish and install custom interior trim from any recent historical period or creative movement, create our own style, or simply install pre-fabricated trim, all to the highest standards of workmanship. 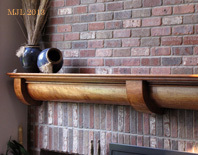 This includes doors, windows, window trim, stairs, handrails, casing, base, fireplace mantles, wainscoting, chair rails, crown molding, closet organizers, built-in bookcases, shelves, and cabinets of all kinds, shapes and sizes. Shoji screens are used in Japan as both window coverings and room dividers. They can be fixed or operable, made to slide side to side or move up and down. Shoji consists of an outer frame with sliding tracks, the rails and panels of the shoji itself and a grille work of delicate sticks called kumiko, made strong by the use of half lap joinery. 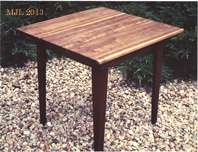 The shoji shown here are made of quartersawn black walnut and finished with natural hand-rubbed Danish oil. The "paper" is a tan Dragon Cloud pattern fiberglass panel 1 mm thick. 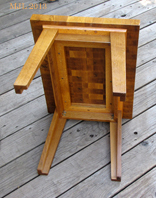 The frame is made using traditional mortise and tenon joinery secured with rice glue. We have a great deal of experience designing and creating shoji screens for both commercial and residential clients. If you have a need of this elegant craft, don’t hesitate to contact us for a free estimate. Among the greatest woodworkers in the world, the Japanese have set standards of craftsmanship and excellence in design that few can equal. 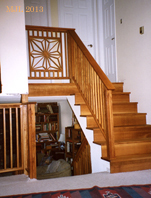 This quartersawn white oak stair and handrail system incorporates two Asanoha panels, a detail borrowed from the world of the master shoji maker. Delicate in appearance, these structures are extremely strong. The secret of their construction lies in the use of an integral wooden hinge as thin as two sheets of paper and a key that locks it all into place. We also do shoji screens as both window coverings and room dividers. 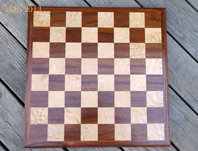 All our chessboards are designed to fit the standard Staunton sets used in tournament play. The ¾” thick squares are splined in both directions with 1/8th inch tempered Masonite, slightly staggered in height so as to form half lap joints at all corners. The borders are also splined to the board by this method. 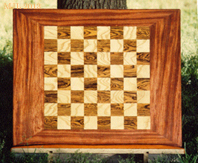 The white squares are all birds-eye maple and the dark squares an exotic hardwood of one species or another, ranging from bubinga to cordia to mordillo. The borders are made of a complimentary hardwood stood on edge to add stability to the boards. These boards were made to last. With proper care they will still be in service when your grandchildren have ceased to play. 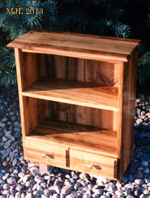 This small wall cabinet was made from Queen Ann Cherry wood harvested from Roy Holubar’s yard just above Andrews Arboretum. Native trees and fruit wood in particular are a neglected local resource. Boulder is uniquely situated in a narrow climatic band that allows us to grow dozens of species of trees that would not survive 30 miles to the east or 2 miles to the west. We strive to use local materials whenever possible. 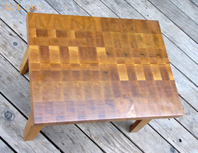 The traditional American butcher block was made of Upper Peninsula Michigan hard maple. The grain was run vertically so that the knives and cleavers would not chip the surface. The grain parted around the blades and the strength of the long fibers remained intact. The blocks would begin life as three foot tall cubes resting in sturdy maple bases. As the sawdust and the wire brushes used to clean the blocks every evening wore away at the wood, the surface would develop hills and valleys of uneven wear. The blocks could then be flipped over and the former bottom used as the new top until it too was deeply worn. Eventually, when the valleys were very deep on both top and bottom, the blocks were sent back to the wood shop where a large capacity band saw trimmed them level again. They would be shimmed up in their deep-sided bases and the process begun all over again until there was very little left of the original block. Whenever we do a project that involves very thick hardwood, regardless of species, we use the scraps and short cut-offs to make butcher block table tops. This gives a very unique appearance to the table: rich, sturdy and nostalgic. A stout and elegant base of the same hardwood creates an object of masculine strength and enduring beauty. Japanese homes utilize every square inch of space. A traditional step chest serves both as storage and a stairway to the next level of a split-level home, and is usually just three or four treads high. The step chest shown here serves the same purpose for a western home, a full flight of stairs from one main level to another. The body of the cabinet is made of figured cherry veneer plywood. The face frame, side trim, drawer faces and treads and risers are all made of solid cherry. This hourly commission was a one of a kind project and a privilege to execute. Occasionally our clients are industrial manufacturers. We have considerable experience designing and building crates and cradles for the safe and economical shipping of the largest objects. Our goal is to avoid the additional expense of wide loads and the inefficiency of high clearance routes. Bring us your unique and unusual project and we will find the best solution. Challenge us to save you money and protect your product. Due to the clear-cutting of rain forests and jungles and the shrinking habitat of many endangered species, we discourage the use of non-renewable exotic species. Any species specifically grown for harvest in a sustainable manner is acceptable. The use of our own many beautiful domestic hardwoods is today our standard practice. Many lesser known species of North American hardwoods offer a remarkable range of color and appearance and a pleasant alternative to the use of vanishing third world resources. Please inquire. We carry a small inventory of unique items specifically for sale. These include chess boards, jewelry boxes, kief boxes, book boxes, and matted photographs in custom made frames. Please inquire if you are interested in any of the items in our catalogue.